This system was taught to me by Dave Segal, whom has taken many hours of instruction from Hal, Stan and Ron. I’ll cannot thank this guy enough for is vast knowledge of pivot aiming, and how it has changed my game. Thanks Dave! All pivot aiming systems have their own refinements and approaches, they all work well. This system I am about to explain shares common elements with each. I’m not sure if it’s fair to call it 90/90 or CTE, although it is an offset and pivot system with a 1/2 ball pivot. Therefore, I am going to label it as a hybrid to distinguish it from the other adoptions of offset and pivot systems out there. A note on this system: the 1/2 ball pivot is probably not well suited for pivot-aim beginners. It is an advanced technique. 1/2 ball has a larger pivot offset, thus more to go wrong if you are unfamiliar with it. For those wanting to dip their toes into the pivot aiming waters, I would highly recommend Stan Shuffett’s CTE/Pro One DVD. Stan has refined CTE, making the whole system more objective, and (IMHO) easier to use. That is where I learned CTE, and I still use it. Only after you get comfortable there would I venture into these advanced techniques. These systems are not any more or less accurate, they are just different ways of executing the same core offset and pivot system. Also calling Stan or Ron for personal training would be a great idea if you decide to get serious about this stuff. With this system there are three types of shots to familiarize yourself with: Thick Cuts, Thin Cuts, and Very Thin Cuts. These may be applied to left and right cuts, so the system boils down to 1L, 1R, 2L, 2R, 3L, 3R. This will make callouts much easier on demonstration videos and paragraphs of text. On a thick cut shot, stand behind the shot and line up your eyes/head/body to the Center-To-Edge-Line (CTEL). Do this while standing upright, ready to step down into the shot. The CTEL is always on the outside of the shot. That is, Cue-Ball-Center (CBC) to Object-Ball-Right (OBR) on left-cuts, and CBC to Object-Ball-Left (OBL) on right-cuts. On a straight-in shot, the CTEL/ETE can be either side. Once you are on this line, move your head to the outside of the CTEL until the CB’s inside edge aligns visually to the OB’s inside edge. This ETE line is always on the inside, or pocket side of the shot. The ETE line is what we will call the secondary reference line. On a thin cut shot, instead of lining up the secondary reference line to the OB edge, we will line it up to the Object-Ball-Center (OBC.) Everything else is exactly the same as a thick cut shot. Same pivot, same everything. You only change the lineup of the secondary reference line. For very thin cuts, there is no CTEL. We only line up the inside edge of the CB to the outside 1/8th of the OB. Again, pivot and everything else is the same. For left or right cuts you switch which sides the CTEL and secondary reference lines are on. The pivot is still exactly the same, left-to-right. The reason this works is because the pivot is a 1/2 ball (edge of cue ball to center cue ball.) If you prefer to pivot right-to-left, that will work also. I am right handed and left eye dominant, and left-to-right feels most natural. You could switch the pivot for different types of shots, but I strongly suggest you pick one and stick with it. You will get very good at that one motion for every shot. Now, a word on the pivot. It is important to realize that the pivot point does not happen at the bridge hand. If you did that, you would likely over-pivot almost every shot. 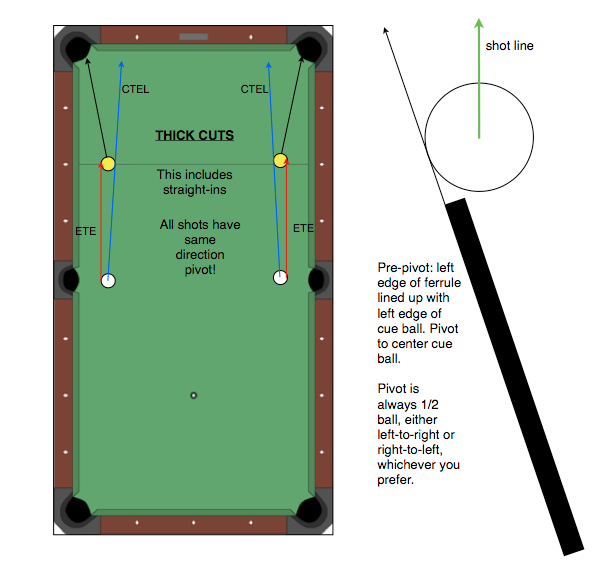 The pivot is something that happens farther back on the cue, closer to the joint of the cue. Luckily, we don’t have to even think about where this point is, as this works itself out with a bit of practice. Just focus on executing the shot as prescribed in this article. One thing that helps is to think of your pivot arcing along the object-ball shot circle. With this concept in mind, after some practice you will notice the pivot is very slight on longer shots, and a bit more pronounced on shorter shots. Just think of pivoting along this arc, and with practice the pivot will be come second nature, much like learning to ride a bike. Again, do not sweat the pivot point, but instead focus on executing exactly as prescribed. Q: When do I switch between thick/thin/very thin? A: This may vary from person to person, depending on eye dominance and how you perceive a given shot. I am very left eye dominant and right handed. I line up all shots with my left eye, and I always put my left eye over the shot line. For me, the transition from thick to thin happens right about the 1/2 ball hit, or 30 degrees. From thin to very thin happens around the 1/4 ball hit, or 49 degrees. That said, there are slight variances depending on the distance between CB and OB. The farther the distance, the more I tend to use thick over thin, or thin over very thin. The best way to work this out is through practice. If you line up a shot and it doesn’t look right, stand up and try again. Eventually shot recognition will make this automatic. Q: Where is the pivot point? A: Again, this is something that will vary from shot to shot, and it is somewhere behind the bridge for most shots. This is not something you need to worry about, but instead think of the shot circle (diagramed above) when you pivot. The actual pivot point will work itself out with practice. Q: How do I know where to put my bridge hand? A: When you line up your eyes/head/body on the secondary reference line and move straight in, your bridge hand will fall into a natural position. This is another one of those things that comes with practice, and not something you need to focus on. The important thing is get lined up squarely on the reference line, move straight in, and focus on putting the cue stick edge even with the cue ball edge. That said, I would estimate that a 10-12″ bridge is going to work well for most shots, and a closer bridge for shots where CB-OB are less than 1 diamond apart. Q: Do I really need pivot aiming on easy shots? A: It is not a matter of needing pivot aiming, but a matter of being consistent. I use it on every shot. I visualize every shot with objective centers and edges. I don’t bother with “do I need pivots here”, I just execute every shot the same way. Once you are comfortable with pivots the execution becomes quick and seamless, and to be honest it would feel rather awkward not using it on some shots. Q: What does pivot aiming have over traditional aiming methods such as ghost ball? A: In a word: objectivity. With aiming systems such as ghost ball, you rely on visualizing invisible contact points, or invisible balls. Some days this works well, some days not. 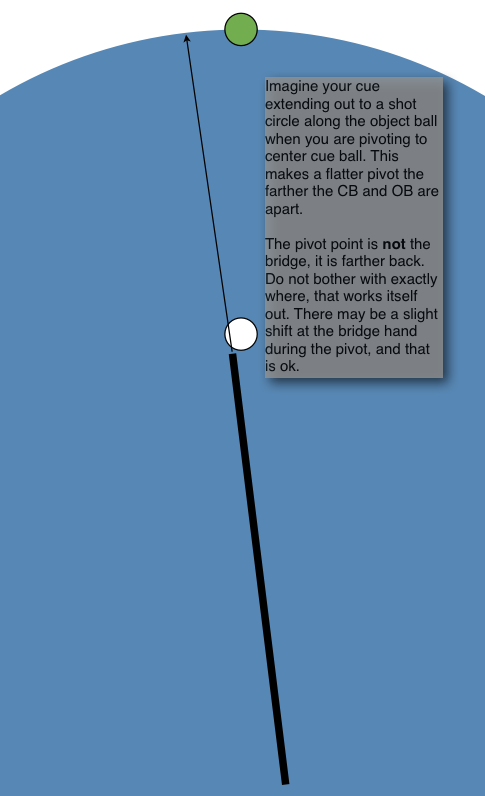 Pivot aiming uses centers and edges of balls for the initial line-up. These are highly objective targets that you can see. The half-ball hit is the only objective aiming point with ghost ball, and is very easy to shoot. Pivot aiming makes all shots similar to half-ball hits in regards to objective aiming targets. Of course you must back up any aiming method with solid fundamentals. Pivot aiming can’t compensate for that. Q: How long does pivot aiming take to get “in the zone”? A: It can pocket balls right away just going through the motions. However, getting acclimated to it can take weeks to months. I practiced only once or twice a week and it took eight months to get to where it feels natural to me, and I’m always refining it. If you have more time to work on it, it could be weeks or even days. Some get it clicking in hours, but don’t sweat it if you don’t. Do not expect this system to work immediately. It is a very different way of lining up shots. It takes a while for the mind and the mechanics to become proficient. There will be head scratching at first, that is a given. Don’t give up, give it a chance to work! Q: Does pivot aiming require any “feel”? A: Here is the bottom line: By pivot aiming, the results gained by the effort put in far exceed anything I got from shooting at invisible points and invisible balls. Aiming by using objective references (centers and edges) is what I believe to be the nerve center of these systems. With practice the subconscious mind learns the motions, and the conscious mind just focuses on line up, slide in, pivot, shoot. Another aspect of pivot aiming is visual intelligence. Every OB->CB->pocket relation has a unique visual. Through practice, you learn to find the right eye position for any given shot. This is how you can line up two shots exactly the same but with a slightly different relation and still hit center pocket. Whether visual intelligence is the same as “feel” is up to interpretation, and IMHO irrelevant to the outcome. There are a few adjustments to the system for certain shots, but only a couple. Adjustment #2: For shots where the CB-OB distance is closer than 1 diamond, the system moves up one level: shots that are normally lined up ETE become ETC, and shots normally lined up ETC become Edge-To-1/8th. The bridge hand also moves closer to the shot, and the pivot point will be closer to (or on) the bridge hand. Again, focus on the shot circle. Here is the real beauty of this system. If you have been paying attention, you will notice that you don’t need to look at the pocket when executing a shot. Yes the pocket is involved during shot selection, but not during execution. To shoot a bank shot, simply find the natural angle to the rail (there are many ways to do this, here is what I do.) Once you know the natural angle, treat it as if shooting straight to a pocket. Just pick the secondary reference line according to this angle. Of course on a bank shot there are other factors involved with a rail, so read up on banks and how to adjust for them. Generally, on a cut-angle bank add about a 1/2 tip of outside english. On a cross over bank, just hit center ball. Another tid-bit on banks. If you notice, there are six different possible visuals on any given shot: 1L,1R,2L,2R,3L,3R. In theory if you hit the ball perfect with every nuance (rails, cloth, humidity, how the table is playing, etc.) taken into consideration, each of these visuals will send the object ball into one of the six pockets on the table. Some will involve one or more rails. Find a specific bank you want to make, estimate the angle into the first rail, then lineup the shot and see where it lands. Figure out the adjustments for spin, then try similar banks from different places. This is a system that gets you to the shot line. It does NOT take into account the affects of Contact-Induced-Throw (CIT), spin or deflection. You must take these changes into account on your own. However, this system (as with most any aiming system) brings you to the geometric pocket center so you have wiggle room for these sorts of things. Practice is your best teacher. See the tips section below regarding CIT. The best way to add english to a shot lined up with this system (or for any shot IMHO) is by using Back-Hand-English. There is another post that covers this topic. Eye dominance plays a large role in lining up shots. I have a post about that here. Contact-Induced-Throw (CIT) is a natural phenomena that happens on most any shot in pool. CIT is most pronounced on shots near a half-ball hit. It is least pronounced on very thick and very thin shots. CIT is also more pronounced on slower shots, and when the CB and OB are close together. CIT can be compensated for with speed and/or outside spin. I usually blend a bit of outside spin into all shots, specifically those close to a half-ball hit. If you find yourself shooting balls long of the pocket, try adding some outside spin. I use either a 1L or 1R for all break shots into the head ball. It is the same as a straight-in shot. This will result in hitting the head ball square in the face. There is nothing like the feeling of this solid control, getting a resounding *crack* and the cue ball popping straight back off the head ball! To visualize where the center of the ball is, look at the very top of the ball. This will get you hyper-accurate on finding center ball for shots that use it. With rail shots where you don’t have room for a full length bridge, you will learn to slide the bridge hand into position during the pivot. This will come once you get comfortable how the pivots work. It is imperative to be exact to make this system work. Line up the CTEL and secondary line exact. Slide in with the cue tip exact. Pivot to center exact. Do not get sloppy! If you start missing shots, concentrate on being exact every step of the way. That is, in a nutshell, the entirety of this pivot aiming hybrid. I plan on backing this up with a video of shot demonstrations when I get a chance. I hope you enjoyed reading! There is a thread running on AZB about this post, feel free to post questions here or on there. This entry was posted in CTE, Instruction and tagged 90/90, Aiming, CTE, Pivot. Bookmark the permalink. I sincerely appreciate that you have taken the time to put this thoughtful post up. I’d give a dollar if someone could SHOW me. When I look at the CTE I’m in a perfect position. Then, I have to totally move or slide my upper body L or R to aim along the ETE. Then, I have to pivot my body and move my bridge to fit the shot. Why is the CTE necessary when we only aim ETE? Why don’t we start there? My shots seem to hit long each time and I’m trying very hard to exactly mirror the table diagram. I’m sure it must be me but I’ve hit balls a lot for the last three days and I don’t see improvement. I know, I know it reflects on me and not the system but as Lee Brett says “Poor practice makes permanent” (I think thats the quotation) and I would like to start out correct. The secondary line gets your eyes in the correct offset from CTEL. The CTEL is important to get everything in the right alignment to start. It is only a slight movement. Try close shots first, get the hang of it before going to longer ones. The video above shows how the tip moves in and pivots. Do you place your back foot on the CTE line or the ETE line. I believe the back foot would be placed at the secondary reference line, so ETE/ETC/ET8. I use Brett Lee’s approach where the back leg is at 1:00 to the shot. The ETE line makes all the difference, I still really can’t explain why but it does as I’ve just spent a few hours on it. I’ll play around with back foot tommorrow and see what happens as I’ve been doing everthing on the CTE line. Can you correct me on this if it’s wrong. 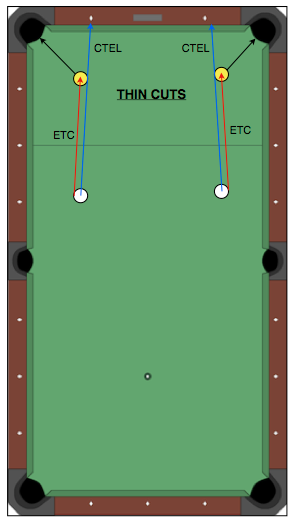 The ETE line or secondary line which you line up with your eyes will place the cue ball center in a slightly different centre then if you just use the CTEL line? Because you’ve shifted your visuals. PS: I think i’ve got it. 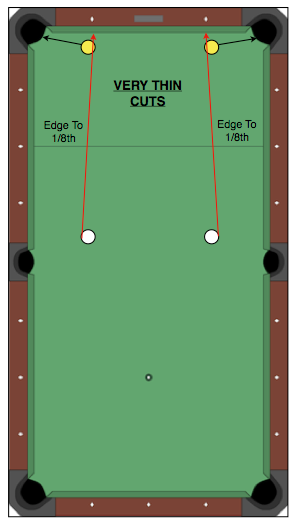 When you are in the pre-pivot positon, with the edge of the ferrule in line with the edge of the cue ball, are you aiming at a particular edge of the object ball? This is where I am having a difficulty. Sometimes, while I have the right edge of the ferrule aiming at outside edge of the object ball. did he mention to you to not share this info??? It is a perceptual system, not a angle-in / angle-out system. Every CB/OB position is unique, and will result in a unique shot angle. Your perception gives you the correct angle, but you need not worry about that, just apply the system as stated. Some time at the table will reveal this visual perception phenomena, which is what CTE is all about. davidcotter is correct. This “method” cannot possibly work. All snooker systems are perceptual. This statement means nothing and points to the spurious nature of the “method”. Also, the description of this false technique is too vague. For example, what does “stand behind the shot and line up your eyes/head/body to the Center-To-Edge-Line” mean? Do you mean line up square on? What does “move your head to the outside of the CTEL” mean? Move your body and head, tilt your heard, etc.? I almost fell over, off balance! I was silly enough to try this bogus method. I advise others not to bother and learn the angles … unless you are a natural.